Alim, H. Samy. (2003). On Some Serious Next Millennium Rap Ishhh Pharoahe Monch, Hip Hop Poetics, and the Internal Rhymes of Internal Affairs. Journal of English Linguistics, 31(1), 60-84. Alim, H. Samy. (2006). Roc the Mic Right: The Language of Hip Hop Culture. Routledge. Alim, H. Samy, Ibrahim, Awad, & Pennycook, Alastair (Editors). (2008). Global linguistic flows: Hip hop cultures, youth identities, and the politics of language. Routledge. Alim, H. Samy & Adam Haupt. (2017). “Reviving Soul(s): Hip Hop as Culturally Sustaining Pedagogy in the U.S. & South Africa”. Culturally Sustaining Pedagogies: Teaching and Learning for Educational Justice (Django Paris and H. Samy Alim, eds.). Teachers College Press, Columbia University: New York. Alim, H. Samy and Pennycook, Alastair. (2007) ‘Glocal Linguistic Flows: Hip-Hop Culture(s), Identities, and the Politics of Language Education’, Journal of Language, Identity & Education, 6(2), 89 — 100. Appert, Catherine M. (2016). “Locating hip hop origins: popular music and tradition in Senegal.” Africa, 86(02), 237-262. Appert, Catherine M. (2016). On Hybridity in African Popular Music: The Case of Senegalese Hip Hop. Ethnomusicology, 60(2), 279-299. Chang, Jeff. (2007). “It’s a Hip-Hop World.” Foreign Policy, no. 163 (November–December 2007): 58–65. Charry, Eric (Editor). (2012). Hip Hop Africa: New Music in a Globalizing World. Bloomington: Indiana University Press. Cho, G. (2010). Hiplife, cultural agency and the youth counter-public in the Ghanaian public sphere. Journal of Asian and African Studies, 45: 406-423. DOI: 10.1177/0021909610373888. Clark, Msia Kibona. (2012). Hip hop as social commentary in Accra and Dar es Salaam. African Studies Quarterly, 13 (3), 23-46. Retrieved from http://www.africa.ufl.edu/asq/v13/v13i3a2.pdf. Clark, Msia Kibona. (2013). The struggle for hip hop authenticity and against commercialization in Tanzania. Journal of Pan African Studies, 6 (3), 5-21. Clark, Msia Kibona. (2014). The Role of New and Social Media in Tanzanian Hip-Hop Production. Cahiers d’études africaines, (4), 1115-1136. Clark, Msia Kibona and Koster, Mickie Mwanzia (Editors). (2014). Hip Hop and Social Change in Africa: Ni Wakati. Lanham: Lexington Press. Englert, Birgit. (2003). Bongo Flava (still) hidden: ‘Underground’ rap from Morogoro, Tanzania. Stichproben (Wiener Zeitschrift für kritische Afrikastudien), 5 (3), 73-93. Retrieved from http://www.univie.ac.at/ecco/stichproben/nr5_english.htm. Gueye, Marame. (2011). Modern media and culture in Senegal: Speaking truth to power. African Studies Review 54(3), 27-43. Haaken, Janice, Wallin-Ruschman, Jennifer & Patange, Simona. (2012). Global hip-hop identities: Black youth, psychoanalytic action research, and the Moving to the Beat project. Journal of Community & Applied Social Psychology, 22, 63-74. Haupt, Adam. (2001). Black thing: Hip-hop nationalism, ‘race’ and gender in Prophets of da City and Brasse vannie Kaap. In Z. Erasmus (Ed), Coloured by History, Shaped by Place: new Perspectives on Coloured identities in Cape Town (173 – 180). Kwela Books. Haupt, Adam. (2008). Stealing Empire: P2P, Intellectual Property and Hip Hop Subversion. Cape Town: Human Sciences Research Council (HSRC). Haupt, Adam. (2017) “Mix En Meng It Op: Emile YX?’s Alternative Race and Language Politics in South African Hip-Hop.” M/C Journal 20. Herson, Ben and McIlvaine, Magee. (Directors). (2009). African Underground: Democracy in Dakar. [Motion Picture]. United States, Nomadic Wax/Sol Productions Foundation. Herson, Ben. (2011). A historical analysis of hip-hop’s influence in Dakar from 1984 – 2000. American Behavioral Scientist, 55(1) 24–35. Hill, Joe. (2016). “Sufi Hip‐Hop and the Aesthetics of Islamic Authority in Dakar.” In Proceedings of the African Futures Conference, vol. 1, no. 1, pp. 270-273. Kellerer, Katja. (2013). “Chant Down the System ‘till Babylon Falls”: The political dimensions of underground Hip hop and Urban Grooves in Zimbabwe. Journal of Pan African Studies, 8 (3), 43-64. Künzler, Daniel. (2007). The “lost generation”: African hip hop movements and the protest of the young (male) urban. In M. Herkenrath (Ed. ), Civil Society: Local and Regional Responses to Global Challenges (pp. 89-128). Zurich: Deutsche Nationalbibliothek. Künzler, Daniel. (2011). South African rap music, counter discourses, identity, and commodification beyond the Prophets of Da City. Journal of Southern African Studies, 37(1), 27-43. Dipannita Basu and Sidney J. Lemelle (Editors). (2006. The Vinyl Ain’t Final: Hip Hop and the Globalization of Black Popular Culture. London: Pluto Pres. Lennon, John. (2014). Assembling a revolution: Graffiti, Cairo and the Arab Spring. Cultural Studies Review, 20(1), 237-375. Ludl, Christine. (2008). “To skip a step”: New representation(s) of migration, success and politics in Senegalese rap and theatre. Stichproben: Wiener Zeitschrift für kritische Afrikastudien, 14(8), 97-122. Magubane, V and Offer, E. (2007). Counting Headz: South Afrika’s Sistaz in Hip Hop (motion picture). Chop Shop Multimedia. Marsh, Charity & Petty, Sheila. (2013). Globalization, Identity, and Youth Resistance: Kenya’s Hip Hop Parliament. MUSICultures, 38, 132-143. Mokua, Ombati (2013). Graffiti: A powerful innovative weapon broadening the horizons of social transformation in Kenya, presented at the Conference on Children and Youth Affected by Armed Conflict in Kampala, Uganda, 2013. Moreno Almeida, Cristina. (2017). Rap Beyond Resistance: Staging Power in Contemporary Morocco. Palgrave Macmillan. Mose, Caroline. (2013). Swag’ and ‘cred’: Representing Hip-hop in the African city. Journal of Pan African Studies, 6 (3), 106-132. Mwangi, Ewan. (2004). Masculinity and nationalism in East African hip-hop music. Tydskrif Vir Letterkunde, 41(2), 5-20. Ndlovu, Musa, and René Smit. (2016). “Kwaito, hip-hop and television in South Africa: a case study of the Yizo Yizo 3 series and soundtrack.” Revista Interin, 11(1). Ntarangwi, Mwenda. (2009). East African Hip Hop: Youth Culture and Globalization. Champaign, IL: University of Illinois Press. Ntarangwi, Mwenda. (2010). African hip hop and politics of change in an era of rapid globalization. History Compass, 1316–1327. Ntarangwi, Mwenda. (2016). The Street is My Pulpit: Hip Hop and Christianity in Kenya. University of Illinois Press. Pennycook, Alastair. (2007). Language, localization, and the real: Hip-hop and the global spread of authenticity. Journal of Language, Identity, and Education, 6(2), 101-115. Perullo, Alex. (2005). Hooligans and heroes: Youth identity and hip-hop in Dar es Salaam, Tanzania. Africa Today, 5 (4), 75-101. Perullo, Alex. (2012). Immitation and Innovation in the music, dance, and camps of Tanzanian youth. In E. Charry (Ed. ), Hip Hop Africa: New Music in a Globalizing World (pp. 187-210). Bloomington: Indiana University Press. Rabine, Leslie W. (2014). The graffiti art movement in Dakar. African Studies Quarterly, 14(3), 89-112. Retrieved from http://www.africa.ufl.edu/asq/v14/v14i3a6.pdf. Reuster-Jahn, Uta. (2008). Bongo Flava and the electoral campaign 2005. Stichproben: Wiener Zeitschrift für kritische Afrikastudien, 14(8), 41-69. Sajnani, Damon. (2013). Troubling the Trope of ‘Rapper as Modern Griot’. The Journal of Pan African Studies, 6(3), 156-180. Saber, Rasha. (2014). Untouched: Egypt’s Revolution in Graffiti. Delizon Press. Salois, Kendra. (2014). “The US Department of State’s ‘Hip-Hop Diplomacy’ in Morocco.” In Music and Diplomacy from the Early Modern Era to the Present, ed. Rebekah Ahrendt, Mark Ferraguto, and Damien Mahiet. New York: Palgrave Macmillan. Saucier, Paul K. (Editor). (2011). 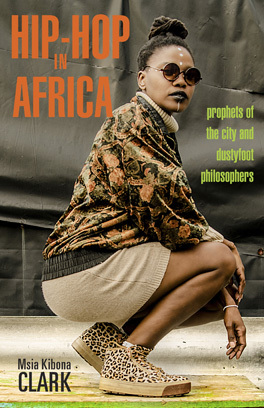 Native Tongues: An African Hip-Hop Reader . Trenton, NJ: Africa World Press. Saucier, P. Khalil (2015). Necessarily Black: Cape Verdean Youth, Hip-Hop Culture, and a Critique of Identity. Michigan State University Press. Sene, C. Director. (2012). 100% Galsen. [Motion Picture]. Senegal, AfricanHipHop.com. Shipley, Jesse Weaver. (Producer). (2007). Living the Hiplife (Motion picture). United States: Third World Newsreel. Shipley, Jesse Weaver. (2009). Aesthetic of the entrepreneur: Afro-cosmopolitan rap and moral circulation in Accra, Ghana. Anthropological Quarterly, 82(3), 631-668. DOI: 10.1353/anq.0.0074. Shipley, Jesse Weaver. (2013). Living the Hiplife: Celebrity and Entrepreneurship in Ghanaian Popular Music. Durham: Duke University Press. Shonekan, Stephanie. (2011). Sharing hip hop: The case of Nigerians and African Americans. American Behavioral Scientist, 55 (1), 9-23. Spocter, Manfred. (2004). This is my space: Graffiti in Claremont, Cape Town. Urban Forum, 15(3), 292-304. Suriano, Maria. (2007). ‘Mimi ni msanii, kioo cha jamii’ urban youth culture in Tanzania as seen through Bongo Fleva and hip hop. Swahili Forum, 14, 207-223. Waddacor, Cale. (2014). Graffiti South Africa. Schiffer Publishing. Watkins, S. Craig. (2005). Hip hop matters: Politics, pop culture, and the struggle for the soul of a movement. Beacon Press. Weiss, Brad. (2009). Street Dreams and Hip Hop Barbershops: Global Fantasy in Urban Tanzania. Bloomington, IN: Indiana University Press. Williams, Quentin E. & Stroud, Christopher. (2013). Multilingualism remixed: Sampling, braggadocio and the stylisation of local voice. Stellenbosch Papers in Linguistics, 42, 15-36. Williams, Quentin E. & Stroud, Christopher. (2014). Battling the Race: Stylizing Language and Coproducing Whiteness and Colouredness in a Freestyle Rap Performance. Journal of Linguistic Anthropology, 24(3), 277-293. Williams, Quentin E. (2016). “Youth multilingualism in South Africa’s hip-hop culture: A metapragmatic analysis.” Sociolinguistic Studies, 10(1/2), 109.